In this article we aim to present all the important aspects of choosing the right web analytics solution for the healthcare industry. But before we do that, let’s take one step back and delve deeper into the reasons why the healthcare industry needs reliable marketing data in the first place. Over the past few years, there have been only a few sectors experiencing such dramatic disruption as in healthcare. As the third wave of digitization hits the world, the healthcare industry is increasing the volume of patient interactions through various digital platforms. This solution allows them to not only reduce business costs, but also to catch up with the latest trends in customer service. Unfortunately, there are still a few issues holding the industry back from speeding up the process of digitization. One of them, fully understandable, is connected to stringent data privacy regulations imposed on the sector (including HIPAA). However, the other ones may derive from misconceptions and information that is no longer true. There are many myths surrounding digitization of healthcare services. One of which is the idea that only younger generations want to use digital healthcare services such as patient engagement platforms. A recent survey conducted by McKinsey debunks that myth. It holds that patients from all age groups are keen on using digital services for healthcare. And what’s even more interesting: Older patients (50+) want to use digital healthcare services almost as much as younger respondents! Research shows that it’s high time to stop underestimating the value of digital platforms for patients of all ages and get involved in creating user-friendly patient engagement platforms to meet the growing demands of today’s patients. This will require putting analytics tools to work. A short introduction: What is a patient engagement platform and what benefits does it provide? Your patients don’t have to leave the platform to pay for a visit, check their medical records, schedule an appointment, seek medical advice, or perform other healthcare activities. It makes taking advantage of your services less effortful. Providing your clients with one, centralized platform noticeably improves their satisfaction and makes it easier for them to take care of their own health. A McKinsey report showed that “more than 75 percent of respondents would like to use digital healthcare services, as long as those services meet their needs and provide the level of quality they expect.” There are many reasons why healthcare engagement platforms are becoming so popular among patients. One of the most obvious is that the tools allow them to easily adhere to doctors’ treatment schedules, post-discharge plans, and so on. These innovations lead to better healthcare outcomes. Not many people realize that readmissions result in high costs for both patients and hospitals. Thanks to patient engagement platforms, healthcare providers can effectively manage activities such as follow-ups and post discharge treatments. Success in the third wave of digitization depends on first understanding patients’ digital preferences in every channel. But many digital healthcare strategies are still driven by assumptions. That’s why it’s crucial to base your digital strategy on reliable statistics and measurable data. Unfortunately, healthcare is a sector that operates on sensitive data—protected health information (PHI). This kind of data requires going the extra mile to ensure total privacy of patients. That’s why, in order to measure the performance of your healthcare platforms, you need to find a reliable web analytics tool. The one that will allow you to capture all the important information on behavior of your patients but at the same time won’t put your data privacy at risk. In such a demanding sector, operating on huge amounts of confidential data, it’s crucial to apply high privacy standards to all information gathered through data analytics tools. Firstly, it’s necessary to comply with all the regulations imposed on healthcare industry. And secondly, it will avoid data breaches and protect your reputation. Fortunately, there are at least a couple of ways to handle your marketing data with proper respect for the privacy of your clients. The US and Europe have been rushing to make sure that data privacy, particularly healthcare related data, is a top concern of companies based in their territory. Recent regulations and data privacy rules only emphasize this—in the US, health data is regulated by HIPAA, and in Europe the EU has created new data privacy regulation (GDPR) to make Europe fit for the digital age. Adhering to those rules will probably be the most important task you’ll have to accomplish on your journey to creating a compliant web analytics setup. Both HIPAA and the GDPR prescribe the web analytics infrastructure requirements you will have to satisfy in order to fully comply. However, HIPAA also requires signing business associate agreement (BAA) with every third party that has access to the PHI of your patients. Not sure what is a BAA? A BAA is a contract between a HIPAA-covered entity and its business associates. It obliges both sides of the contract to protect protected health information (PHI) in alignment with the guidelines provided by HIPAA. 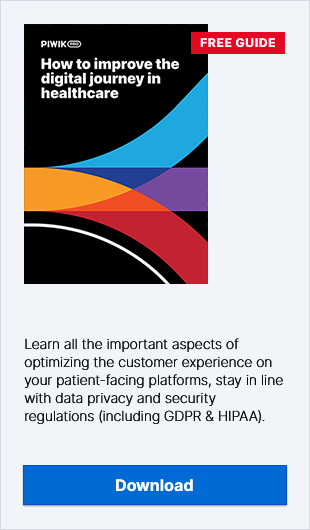 Handling data in alignment with HIPAA introduces advanced data privacy demands which often cannot be met with many standard web analytics solutions (especially those operating in the cloud environment). Signing a BAA introduces major responsibilities for both sides of the contract. As business associates, data analytics vendors are directly liable under HIPAA and can become subject to penalties (both civil and criminal!) in the case of unauthorized use and disclosure of PHI. Fortunately, there’s a way to work around this problem. How? Instead of convincing your vendor to sign a BAA with you, you can seek a web analytics solution that allows you to store all PHI collected on your own servers, without sending any of it to a third party. If you want to learn more about this topic, we advise you to visit this blog post: You Don’t Have to Sign a BAA With Your Web Analytics Vendor to be HIPAA-compliant. It’s one of the restrictions imposed by HIPAA. The regulation states that, in order to provide sufficient security to the collected PHI, you should be able to encrypt your data. It applies not only to the information actively used by your employees, but also to data lying dormant on a server somewhere (data at rest). In this case, a great solution may be a tool kept in an on-premises environment. This resolution also lets you to implement your own compliance procedures and additional security measures. If you want to learn more about the pros and cons of going on-premises with your web analytics, we advise you to read this blog post. One of the most popular authentication techniques is single sign-on (SSO). The method allows to use one set of login credentials to access various accounts and applications. It’s not only extremely helpful for users, but also for the employees operating on the back end. It lets administrators see user activities within the system. It also allows them to monitor users’ accounts from one, easily managed, central database and have total control over the entire stack. The list of the most popular SSO methods includes: SAML (security assertion markup language), LDAP (lightweight directory access protocol) and AOuth2. It’s possible that your company is already taking advantage of one of these solutions. That’s why when seeking the right web data analytics for your healthcare business, you should check if the solution is compatible with your SSO method. The rule of the thumb in the case of collecting data in sensitive sectors is to cultivate data minimization. Not sure what it means? The term applies to the practice of limiting the collection of personal information (in healthcare that will include PHI) to cases where it’s directly relevant and necessary to accomplish a specified purpose. This practice is becoming more and more popular, as companies and governments are beginning to see the value in a “less is more” approach. Why? First of all, recent data privacy regulations such as GDPR and HIPAA demand limiting collection of data to the absolute minimum necessary. Secondly, relatively limited collection of data prevents you from capturing a tsunami of unnecessary information—the kind you’ll never put to good use. That’s why by tracking only the essential aspects of your patient’s behavior, you’ll kill two birds with one stone. A piece of advice: pair your web analytics with a safe tag manager. In the case of limiting the amount of data, a tag management system (TMS) may prove useful. This tool will allow you to pre-define, what particular kinds of data you’ll gather with your web data analytics solution. However, it’s extremely important to find a TMS that will not jeopardize the privacy of PHI you want to collect. That’s why you should definitely look for a privacy-friendly tool (like the on-premises version of Piwik PRO Tag Manager—if you want to read more about it, we encourage you to visit this page). This point is closely connected to the previous one. You should restrict not only the amount of information you want to collect, but also the number of employees who will have access to particular kinds of data. That’s why your ideal web analytics solution should allow you to set granular permissions to reports it generates. That way, you’ll become 100% sure, that confidential information about your patients won’t fall into the wrong hands. You’ll also provide your employees with no more and no less than a decent set of information, which is valuable from their standpoint. After all, you should remember that what can be useful for the UX department, won’t necessarily be essential for your sales team. The right digital analytics can provide a strong foundation for creating effective marketing campaigns, designing user-friendly interfaces and improving the general satisfaction of your patients. However, in the case of enterprises (we can put healthcare organizations in this category) choosing an adequate solution may be a challenge. There are at least a couple of issues you may stumble upon while searching for web analytics that can fit the needs of large business. Huge amounts of traffic can be both a gift and a curse. It proves that many people visit your website and that your services are getting the attention of prospective and present clients. But on the other hand, high traffic automatically narrows down the list of web analytics tools you can use. This is especially the case if you want to avoid data sampling, which typically occurs when your website experiences more than 500,000 hits per month (at least that is true for the free version of Google Analytics). For healthcare organizations dealing with hundreds of thousands of patients on a daily basis, it’s more than likely to occur. Not sure what data sampling means and why it may skew your data? Then you should definitely read this blog post. That’s why you should seek an enterprise-ready tool: one that will allow you to take advantage of advanced functionalities but at the same time handle spikes in website traffic. As a healthcare organization, you probably take advantage of a vast set of channels to communicate with your prospective and present clients. Patient engagement platform (where content is hidden behind a login form). The mobile or app version of your platform. You’ll need a solution that will allow you to track the data from each and every one of them. It should also provide you with valuable reports, giving an overview of the whole customer journey of your patients—the way they interact with your apps, schedule appointments, read your articles or seek medical advice. As you can see, there are a lot of aspects you should consider when looking for the right web analytics platform for healthcare. We’re aware that the list presented above is only the tip of the iceberg, and should be extended to include the particular demands of your business. However, we hope that our article has cast some light on ways of assuring high levels of privacy and security for the PHI your organization collects. If you’d like to deepen your knowledge on this subject, you can also get in touch with Piwik PRO experts. We’ll be happy to provide you with answers to your questions about web analytics for healthcare!